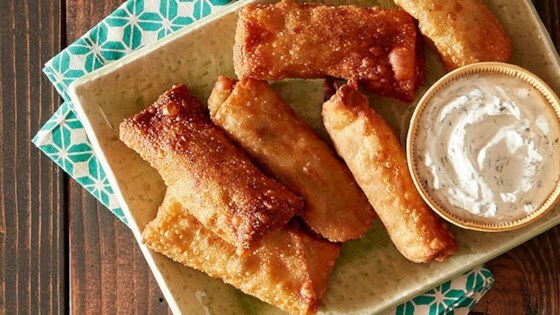 "Mix a blend of Southwestern-style ingredients to make a non-traditional egg roll that excites the palate from Chungah Rhee of Damn Delicious. The cilantro sauce takes the flavors to the next level." Preheat oven to 425 degrees F. Line a large baking pan with Reynolds Wrap(R) Heavy Duty Aluminum Foil. Grease or spray foil to prevent sticking. Combine cilantro, sour cream, jalapeno, mayonnaise, garlic and lime juice in the bowl of a food processor; season with salt and pepper to taste. Set aside. Mash avocados using a potato masher. Add black beans, corn, tomato, lime juice, chili powder, cumin and salt and pepper and gently toss to combine. Place avocado mixture in the center of each wrapper. Bring the bottom edge of the wrapper tightly over the filling, folding in the sides. Continue rolling until the top of the wrapper is reached. Using your finger, rub the edges of the wrapper with water, pressing to seal. Repeat with remaining wrappers and avocado mixture. Place egg rolls on the prepared baking dish. Lightly coat with nonstick spray. Place into oven and bake until golden brown and crisp, about 18 to 20 minutes. Line your baking sheets with Reynolds Wrap® Heavy Duty Foil for stick-free cooking and easy cleanup. The problem with this is that the egg roll wrappers did not bake thoroughly on the inside and were raw which ruined the whole thing. The dipping sauce is delicious, though!